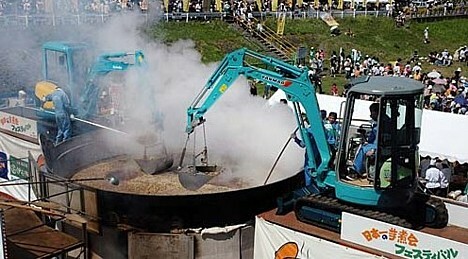 At the Yamagata Imoni Festival ("Yamagata potato stew festival") last weekend, 100 chefs gathered around a cauldron measuring 6 meters (20 feet) in diameter to prepare potato soup for 30,000 guests. The 18th annual festival organized by the Yamagata Chamber of Commerce and Industry was held on the banks of the Mamigasaki River in Yamagata prefecture. As the centerpiece of a PR campaign to spur consumption of local agricultural products, the soup was made entirely from local ingredients, including 3 tons of taro potatoes (satoimo), 1.2 tons of beef, 3,500 blocks of konnyaku (yam paste), 3,500 leeks, 50 bottles of sake, 200 kilograms (440 pounds) of sugar, 700 liters (185 gallons) of soy sauce, and 6 tons of water. After the stew boiled for 4 hours, 2 backhoes were used to scoop it into smaller cauldrons for easier serving. The soup was reported to have a refreshing soy sauce flavor. A separate batch of miso-flavored potato soup with pork was prepared in a smaller cauldron measuring 3 meters in diameter.